...are sustained by my tears of woe!" ...have no concept of personal space!" 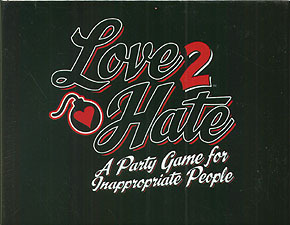 Love 2 Hate is the party game of finishing sentences. One player starts the fun by choosing a sentence Starter card (like hippies, lawyers, or crabs) and then saying if they love or hate the way the group on the card.... The others each choose a Finisher card to fill in the blank, and the player with the funniest or most inappropriate response wins the round. Players take turns picking Starter cards and judging, and the person who takes the most rounds wins the game.